Teaching Idea – Cutting a Dry Cell in Half – ScienceMan! 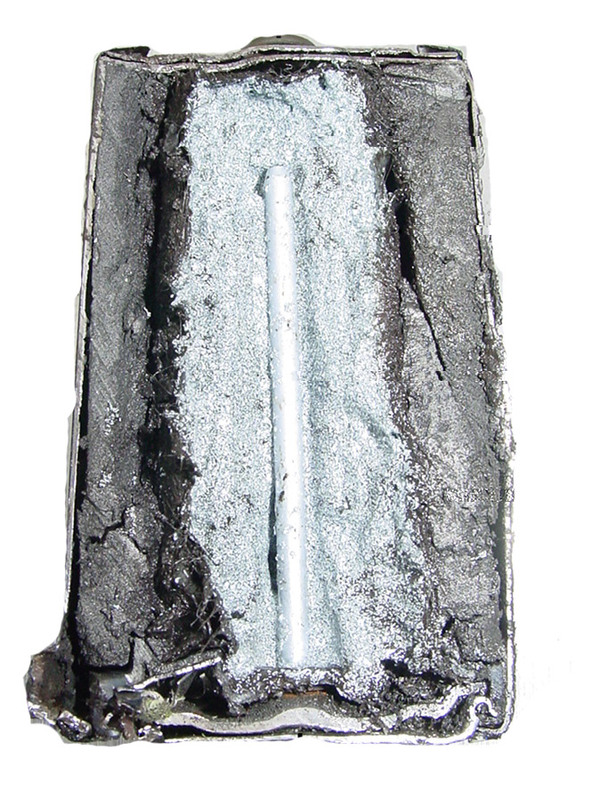 A – combination zinc powder/alkaline electrolyte paste where electrons are released (anode). 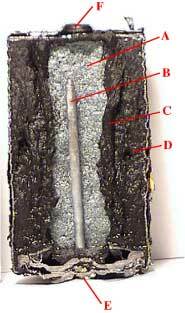 B – brass conducting rod where the released electrons are collected. C – hard to see in the above diagram, but this is a fabric that separates anode from cathode. D – mixture of manganese dioxide and carbon, where the electrons are absorbed (cathode). E – the negative terminal, where the electrons leave. F – the positive terminal, where the electrons return. I’ve prepared a high-resolution photo of a cut dry cell just in case you might want one to use in a quiz. Now if you’re considering cutting one of these cells yourself, please think carefully before proceeding. First, the metal edges produced are real hazard. Second, although there is not supposed to be anymore, some dry cells still contain toxic chemicals. So you really shouldn’t do this unless you know the exact contents of the cell and you are prepared to cut the cell with all safety precautions in place.